POTTERY AVENUE offers this large Polish Pottery bowl with handles will be a featured piece in your collection and a welcomed gift. This is one of the most versatile pieces of Polish pottery available. It is beautifully decorated both inside and out and stunning on display. Fill it with fresh fruit or even popcorn balls. It is perfect for serving salad to a crowd or potato chips at the party. And, because it is Polish pottery and can go from oven to table, you can use it to bake a chicken, roast or for mac n cheese in addition to heating and serving anything . I promise you will love this bowl. Fit for any current or aspiring gourmet. 13x5". Holds 10.5 cups. 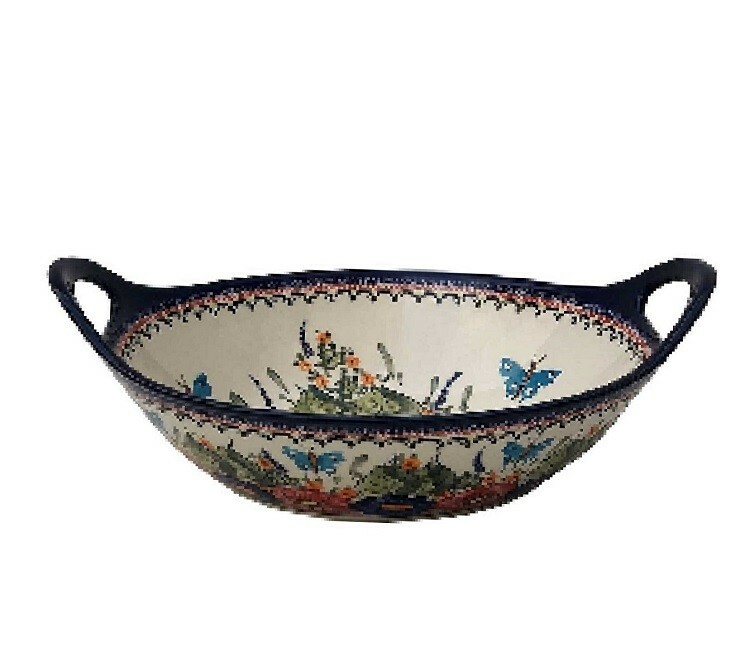 Polish Pottery Strawberry Butterfly pattern is a great piece of art that has been crafted by master artisans from Zaklady Ceramiczne “Boleslawiec” to render this Polish stoneware a uniqueness of its own. The attractive depiction of flowers in a scenic garden background where green bushes and cheerful butterflies surround them from all sides help to create a wonderful display. This handcrafted Unikat stoneware can be put to varied uses without worrying about maintenance. The cobalt-blue rims are neatly complemented with a classic pattern, including multiple panels and a scalloped design to enhance the overall beauty of this Polish art pottery. Hand-Painted Polish Stoneware Folk Art - A Century-Old Tradition. In the small village of Boleslawiec, Poland, hundreds of skilled artisans have migrated to this region to produce wonderful works of art for our daily use in the kitchen and home. They continue the Polish folk art tradition of painting on vessels using the hand stamp technique. These pieces go way beyond just good looks. The unique glaze, clay and high firing temperatures result in cooking vessels of enormous durability. In fact, you can cut right on these pieces without marring the surface. The glaze allows food to release with little or no oil. The pottery retains both heat and cold for long periods of time, making them wonderful pieces for cooking and serving. Dishwasher, oven and microwave safe. This 5 cup casserole with lid will inspire many beautifully prepared recipes while adorning your table with wild flowers and leaves depicting a European landscape. "BUTTERFLY MERRYMAKING 13" HANDLED BOWL & BAKER"